When an operation requiring added privileges must be performed, an operator with the necessary privileges must log into the software by pressing the New Operator button. He can then select himself and type in his PIN. 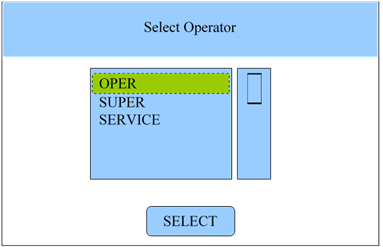 NOTE: When the operator with higher privileges has completed his work, it is recommended that he logs out of the software by pressing the New Operator button on the main screen and selecting the OPER user or any operator with only base access. This will prevent other operators from accessing parts of the software they are unauthorized to access.